For years we have been told to drink water, and plenty of it. Yes, it has amazing benefits for our skin and our digestive system, but did you know the temperature of the water we drink is just as important as the amount? The time of day you consume your water is also vital to a healthy body. Our body needs water daily to replace the amount we lose from sweating, breathing, urine, and feces. Let’s examine the effects and benefits of drinking hot water every day. Our bodies are 70% water. In fact, we can survive without food for an entire month but our system would only last about a week without water. Studies show it is best to start each day with a glass of warm water. Hot water helps clear out the foreign substances in your body. By adding fresh lemon juice to your first glass in the morning, you are stimulating digestion so the water does not have to use more energy to flush out the toxins. Other suggested additives include fresh mint, cucumber, honey, apples, or cinnamon sticks. Drinking warm water stimulates digestion, while a glass of cold water needs time to adjust to the body’s temperature. Hot, or warm, water requires less energy and time to digest food. It has also been shown in studies that drinking cold water at mealtimes hardens food oils, which creates fat deposits in your intestine. This can contribute to intestinal cancer. Help get rid of fat deposits around your central nervous system and maintain a clean blood flow by drinking hot water. Your muscles will thank you, too. We become constipated when our system is dehydrated. As mentioned, warm water stimulates our circulation and digestive systems, which aids our intestines. It is best to consume the warm water on an empty stomach first thing in the morning. The temperature of the water is also key as cold water is harsh on our internal systems. Soaking in warm water or using a hot water bottle can soothe the pain and aches of arthritis. The same holds true for our insides, as warm water calms the central nervous system and improves blood circulation, in turn helping to relax our joints. By consuming hot water, we flush out the toxins that are known to promote premature aging. In addition, water repairs skin cells and improves skin elasticity, which renews your skin. It is never too late to start as warm water can smooth out damaged skin. Drinking hot water can relieve and prevent acne and other skin conditions by flushing out toxins that can clog your pores and make them susceptible to inflammation. Warm water and honey together can be used as a natural cough suppressant. They can also help prevent coughs from worsening as they clear nasal congestion and soothe sore throats. Aside from the known fact that water gives you a feeling of fullness to suppress hunger, hot water also increases your metabolic rate. Since warm water aids in digestion and eliminates toxins, it thereby prevents acidity in the stomach, heartburn, and bloating symptoms. Add lemon to the hot water. Warm water activates and energizes the root nerve endings and can result in soft, shiny, healthy hair. It can also help stimulate the speed of growth of the hair. The scalp benefits as well as it becomes hydrated, which prevents dandruff from forming. Now that we know the top health benefits of drinking hot water, let’s learn how to get the best out of these tips. To get the most of the hot water health benefits, women should drink 90 ounces, or 11.25 cups, daily, while men require 125 ounces, or 15.75 cups. 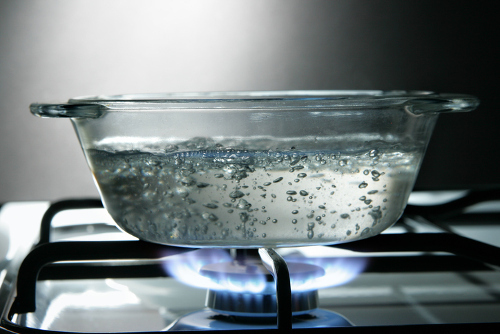 To remove any impurities, always boil the water and let it cool to a lukewarm, tepid temperature. Drinking very hot water can damage mouth and esophagus tissues. The water temperature should make you sweat if you are looking to detoxify. Drink tepid water before and after meals and workouts. Do not drink hot water after exercise as your body temperature is already raised. Also, when drinking water with food, consume only tepid water as cold water draws the energy from digestion to increase its temperature. Sip on warm water during high temperatures and while experiencing any discomfort from diarrhea or vomiting to maintain hydration. As we know, water is crucial to all living organisms, including humans. It is important to replenish the water we lose during the day to maintain good overall health. Hot water helps a multitude of ailments and health concerns as it aids in digestion, gets rid of toxins, improves blood circulation, and relaxes muscles. Drinking hot water for good health on an empty stomach is the best way to start your day as it awakens your body and helps it prepare for the day ahead.